Arnold James (the Company’s founder) moved from North London to St Albans on Christmas Eve 1955. After travelling daily to London for approximately 3 months he sought a job locally and commenced work as a plumber in Welham Green. Some months after this, he decided to start his own company. After visiting one or two builders, he secured work for Miskins, a well-known local building firm who, in fact, built County Hall in Hertford. This was followed by gaining contracts for blocks of flats in Luton and St Albans, and factories in Welwyn Garden City. Despite doing quite a lot of business, money was tight and it took about 9 years before the company started to break even financially. By this time Arnold was employing 7 plumbers and apprentices. 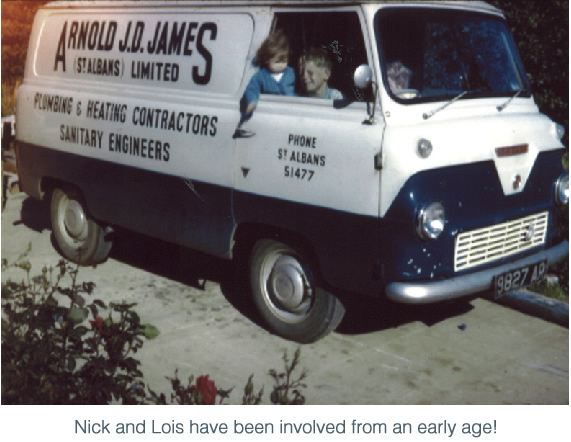 During this period, in 1958, Arnold James (St Albans) Ltd was created. It was suggested to Arnold that he should join the Hertfordshire County Council’s approved heating and plumbing list. Upon achieving this, the volume of work increased considerably and the Company was eventually employing 25 fitters and plumbers. The Company continued to expand and Arnold’s son, Nick joined the firm in 1982, having qualified as a building services engineer with Drake and Scull. Arnold’s main bugbear had always had been that his workshop and office were in separate locations. However, in 1986, he was finally able to purchase a storage and office facility all on one site at the Metro Centre, where the company is still located to this day. At this time, the company were now executing work for the Roman Catholic Board of Education, Hertfordshire County Council, London Borough of Barnet, Bedfordshire County Council, Hertfordshire Fire Brigade among others. Arnold James retired from full time employment with the company in 1994. Since Arnold’s retirement, the company has grown organically and, from one small unit at the Metro Centre, it has now expanded into four units, allowing for our complete range of services listed to be provided to existing and new clients. 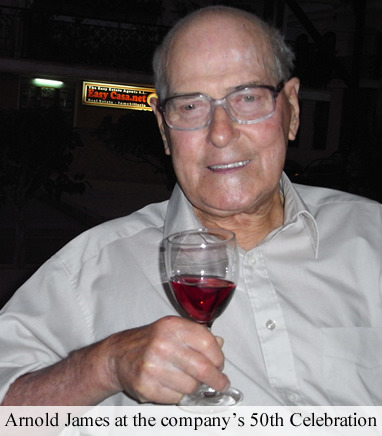 Arnold passed away in February 2015 and is missed by all.